Nudge bars are constructed from aluminium tubing which gives protection without compromising on style. They offer a convenient platform for mounting accessories such as driving lights and CB antennas. Barworld offers Nudge bars suited for any make and model of vehicles from Ford, Hyundai, Mitsubishi, Land rover, Honda, and Nissan. The Aluminium bars protect the radiator grille and surrounding areas without a need to replace or alter the bumper bar. These nudge bars provide a sturdy, air bag compatible mounting system. Nudge bars at the front of a vehicle provides a cost-effective solution to enhance the appearance of a SUV or sedan, whilst also providing a protective shield against scrapes, bumps and minor accidents. The bars can be powder coated to colour of choice if wanted. Nudge bars made from aluminium alloy is suited for medium sized four wheel drives. 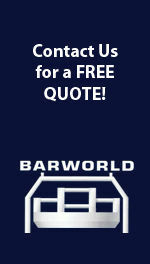 The experienced team at Barworld provides custom designs for your vehicle as per your need. Being lightweight, the Nudge bars are more popular with sedans and SUVs. Barworld ensures high quality Nudge Bars which not only protects the vehicle, but also provides exceptional style and panache.